We offer a wide variety of culinary delights that will satisfy all tastes and demands. We prepare local and Slovenian traditional specialities, meat plates, fish, pasta, vegetarian food and fresh home-made desserts every day. We know that the perfect culinary experience does not only include good food, but also a pleasant atmosphere where guests feel comfortable, and so we have furnished our inn to give you the most relaxation, where you can always feel welcome. We put every effort into satisfying each guest, meeting their individual wishes and tastes. 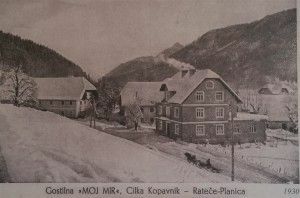 The Vila Moj Mir Inn is located right beneath the hills of the Tromeja – Triple border (the intersection of the Slovenian, Italian and Austrian border, Peč – 1508 m), 100 metres from the main road that runs to Italy. Relaxation and recreation in nature are available just a few steps from the house, where you can explore the magnificent hiking and cycling trails and enjoy the beautiful mountains, and during the winter can also visit the cross-country skiing tracks, ski slopes and ski jumps of Planica. The house was built in 1928 for catering activities. Initially, it served as a dairy restaurant, and the owners then started serving alcoholic drinks when the war started and soldiers became more frequent visitors. Later on, the house also provided rooms which led to the start of accommodation and catering services. 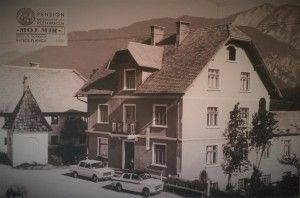 The fourth generation of owners currently runs the inn. 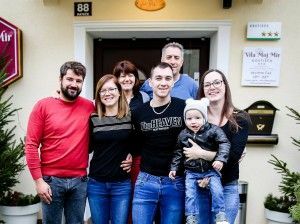 Since the house is located near the border, it is visited by guests from Austria, Italy and other European countries, who enjoy the international cuisine and seafood on offer. We offer local, traditional food (sausages and zaseka (minced lard), želodček (dried pork meat), home-made ham with horse radish, home-made salami, Rateški krapi – potato dough with cottage cheese filling...), various meat and vegetarian dishes, fish, pasta, salad plates...You can also try home-made mushroom soup in a bread cup, porcini (a seasonal dish), game dishes, fried chicken, dumplings, bread dumplings and other specialities. We also have a wide range of home-made desserts, such as gibanica (layer pastry), grmada (cake pudding with cream topping), apple strudel, potica (nut roll), dumplings with cottage cheese and nut filling. You are warmly invited to come and try our cuisine and kind service. You will also be fascinated by the surrounding nature – the magnificent views of the nearby meadows, hills and mountains will overwhelm you.